Biters are supernatural fire-beasts conjured and controlled by Iblis out of the Flames of Disaster, and which serve as opponents in Sonic the Hedgehog (2006). 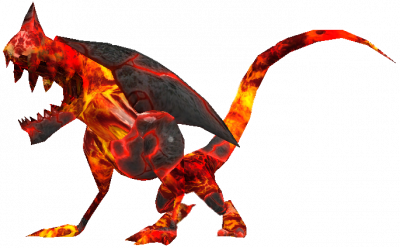 These fire monsters are lizard-like creatures that slowly crawl along the ground or walls and attack when one is least expecting. They differ from the Stalkers by being weaker, having a red-brown colour and simpler methods of attack: fire breathing, jumping with claws outstretched or tail lashes. Biters have absolutely no armor, so a single attack is sufficient to destroy them. Biters return to Crisis City in Sonic Generations. They display basically the same behaviors as before: they stand about looking menacing and spew fire-breath once in a while. However, there are a few instances of Biters dropping right in front of the player, and they occasionally dodge Classic Sonic's Spin Jump. Like their original counterparts, fiery Biters are down for the count in one hit. This page was last edited on 23 September 2017, at 18:23.